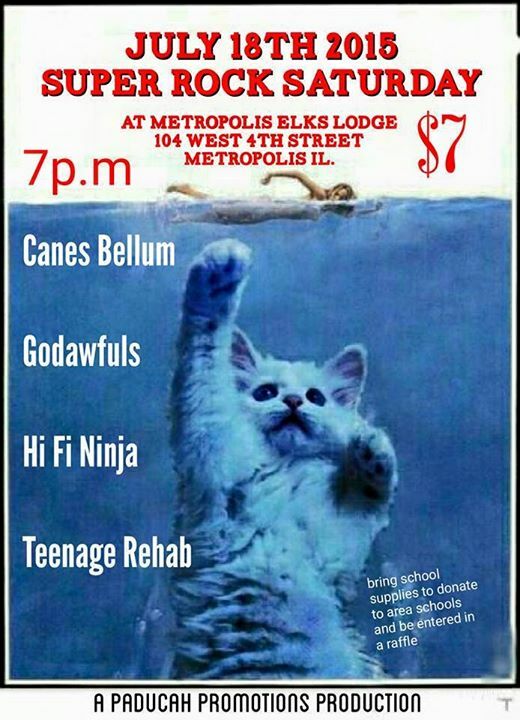 Five bands set to take the stage at the Metropolis Elks Lodge for Super Rock Saturday. Tickets are $7 at the door and be sure to bring school supplies to donate to area schools. ((ZXEL)): a two piece rock band in the vein of Black Sabbath. This will be their second show. Canes Bellum: Making their debut will be Canes Bellum. Each member have been in bands in the area for years and are no stranger individually to live performing. Godawfuls: Hopkinsville band will bring their brand of rock to the area. This 3 piece outfit is full of catchy sing alongs. The Hi Fi Ninja: Together for 7 years, the Hi Fi Ninja return to Metropolis after several performances in the area. During 2009 the band frequently played the Dairy. Teenage Rehab: one of the longest running punk bands in the area return to Metropolis. Tour after Tour and year after year the band gets tighter and better than ever. For information, contact Nathan McCruder at paducahpromo@gmail.com or 270-845-1360. Facebook Event. This entry was posted in All the Buzz - Bee Informed and tagged Elk's Club, music on July 4, 2015 by massacbeeswax.